An innovative software product that will let you know who's calling on the phone, Listen who's calling before you pick up the phone ! eCaller ID is an innovative software product that will let you know who's calling on the phone. 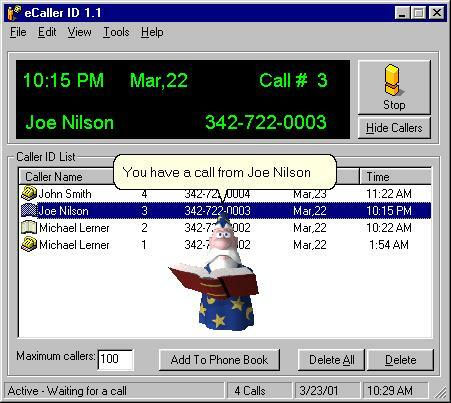 Using a talking animated character, eCaller ID will read aloud the caller name and number. The software is highly customizable allowing you to specify what the character will say and do based on the caller. eCaller ID is simple to use and it's more fun and practical then any regular Caller ID. It allows you to log unlimited number of callers. A Caller ID service from your local phone company is required to use eCaller ID. Know who is calling before you talk. Announces the caller name and his number. Display window includes caller ID information. Popup the Display window as soon as you have an incoming call. Keep track of your callers. Logs all calls including time, date, name and number. Keep as many callers as you wish (The limit is your hard drive!) . Add your callers into eCaller ID Phone Book. Customize it to work the way you want. Select the cartoon character you like. Control the sound, voice and display of eCaller ID. Choose the announcement for each caller. Define rules with certain action. Doesn't interfere with other work. Stays in the system tray waiting for incoming calls. Popups (if you wish so) when you receive a call. Does not interfere with your work. The Caller Number can be displayed in any of the pre-defined formats. It can also be customized to fit any local format you may have. Support for more types of Modems. Improved support that enables you to use more types of modem. The actual name of the caller id now seen for all modems (Used to display "Unknown Caller" as caller name for some types of modems). EZ Phone Recorder - telephone recording software that uses your voice modem to record phone, perfect phone recorder for you. Hot! Picture Caller ID - A Caller ID software-only Caller ID tool for your computer. CallerID Monitor - Turn your PC into advanced full-featured Caller ID device using your modem or ISDN adapter.